A well deserve Congratulations to Ann Harmes for achieving her CCFT credential. 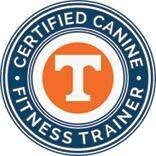 After working very hard with both online and practical training, Ann can now proudly say that she is a Certified Canine Fitness Trainer. If you want to find out more of what is training and involved or are interested in becoming Certified Canine Fitness Trainer click here for the details.